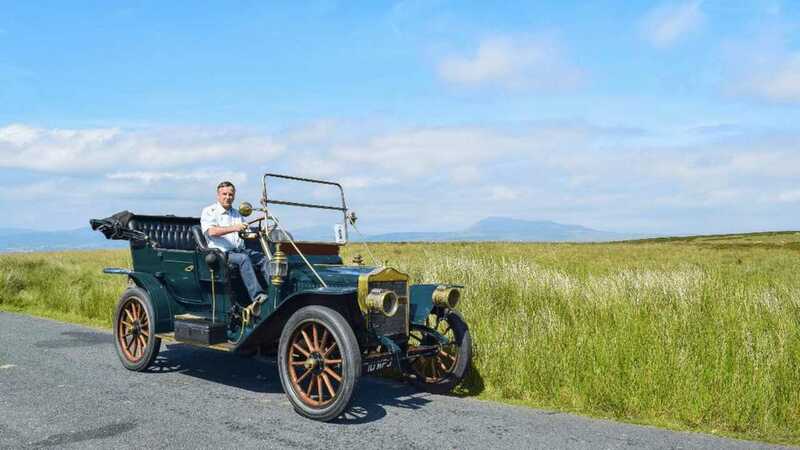 When my dear friend Phil Johnston of Coniston asked me if I’d care to navigate him and his 1910 Maxwell around Lancashire – on a rally with the North West section of the Veteran Car Club (VCC) –there was absolutely no hesitation on my part. The year before, while helping to prepare the Maxwell for a previous rally, I’d realised just how far this intriguing machine seemed from where it had originally been manufactured in America all those decades ago. 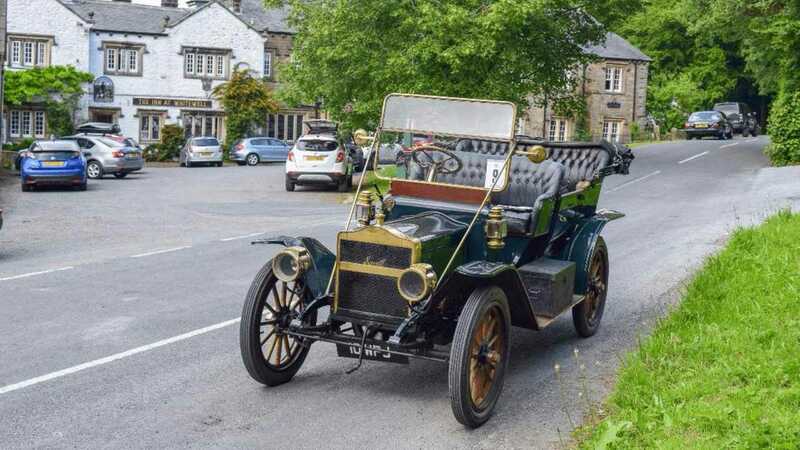 Beneath the Lake District’s imposing Old Man of Coniston Fell, I’d cleaned and checked its green coachwork, wooden wheels, brasswork, tall windscreen and long leather straps holding the fabric roof in position. As I’d worked my way round a pre-war car for the first time, an interest in this era of motor vehicle began to spark. I returned to Coniston earlier this year, in readiness for the VMCC rally. The Maxwell had been safely packaged into its trailer and driven down to the Gibbon Bridge Hotel and Restaurant in Chipping, where I was to meet members of the VCC for the first time. As we sat down to dinner, I simultaneously admired the fine gardens outside the conservatory windows while also answering enthusiastic questioning on my work as a motoring journalist. Throughout the evening I could taste the club’s eagerness for pre-war motoring as much as the good food that was being served. The next morning the Maxwell emerged from its overnight cocoon into bright sunshine, and we were off on our way. Phil had sensed that the day would be hot and so he’d left down the folding roof. Initially we headed west as if aiming for Garstang, the fresh air gently lifting up the corners of my navigational notes as we drove through Chipping and then Inglewhite. 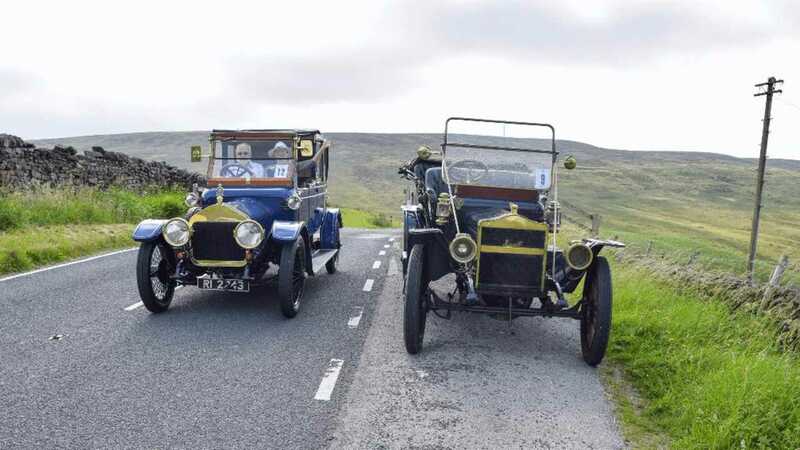 We passed over the busy M6, with the modern traffic appearing fast and aggressive compared with our 1910 motorcar. On the outskirts of Bilsborrow we headed onto Elswick via Pinfold Lane, where the flat farmland and sharp bends reminded me of my home region of the Cambridgeshire Fens. We then passed through Great Plumpton and Westby, before turning off the main road to drive under a red brick archway and join in with a regularity test. This took us up towards Lytham Hall, an impressive Georgian country house, before winding our way through the trees and clocking a time back down in the grounds. The club then split for activities at Lytham Hall, while some enjoyed a tour of the building, I climbed aboard a two-tone double-decker with ‘Fishwick & Sons’ proudly displayed down its sides. The bus was a 1958 Leyland Titan PD2/40 that had been brought along by the Ribble Vehicle Preservation Trust. Having stepped aboard via the rear doorway I enjoyed a scenic route down to Lytham St Annes, where the sight of colourful shops, the bright sandy beach and the arcade out on the Victorian pier brought back childhood memories of holidays in the town with my parents. 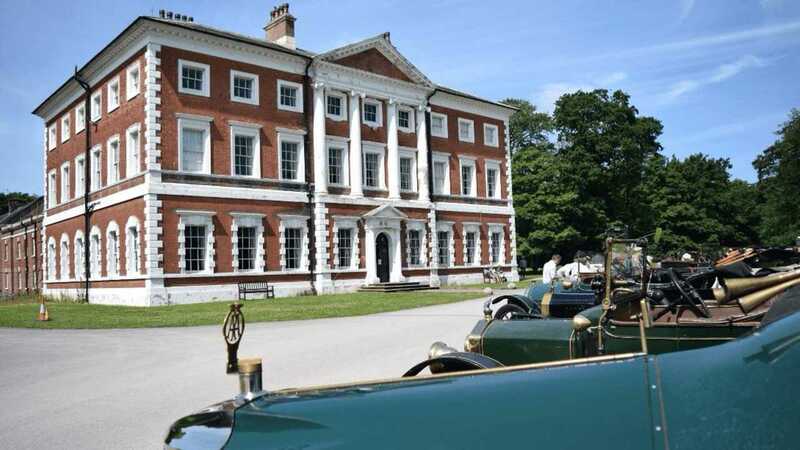 Having returned to Lytham Hall, I found myself fascinated by the story, architecture and detailing of this superb building, while those who’d been here earlier went touring with the Leyland Titan. To my delight I walked the uneven, 400-year-old planks in the Long Gallery. Often I did not feel alone as I wandered with my camera in rooms devoid of other people. The building had a fascinating, slightly dilapidated charm, and the Maxwell was one of the last cars to leave thanks to Phil and I both finding the place to be of such interest. From Lytham Hall we drove along the leafy Moss Side Lane to the delightful village of Wrea Green that is ‘home to a fluctuating number of well fed ducks’. Next came Newton-with-Scales, and soon after we passed through Goosnargh before Phil re-fuelled at Chipping. I had to climb out and hand over the fuel line as Phil stood above the driver’s seat and filled up the tank. I half expected an angry tap from the fuel station windows as the Maxwell’s engine continued to run as he did so. 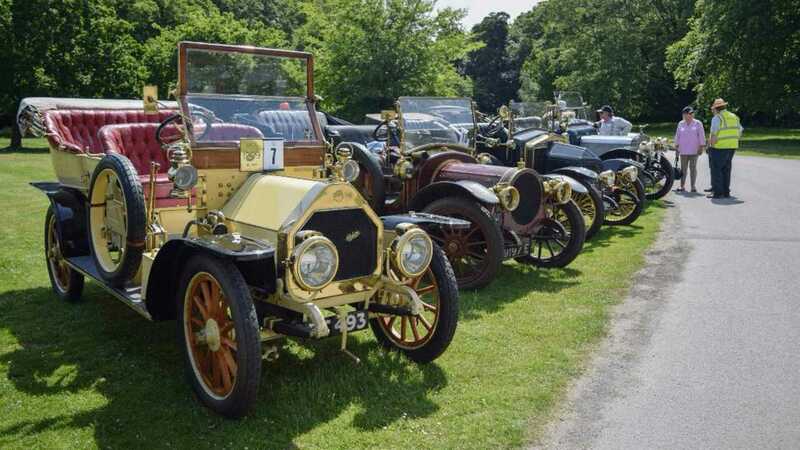 No one seemed to mind – perhaps they didn’t know the correct protocol for re-fuelling a vehicle over 100 years in age. I certainly wasn’t sure, so I just let Phil get on with it. Having survived, we motored on for a few more miles to return to the Gibbon Bridge Hotel. 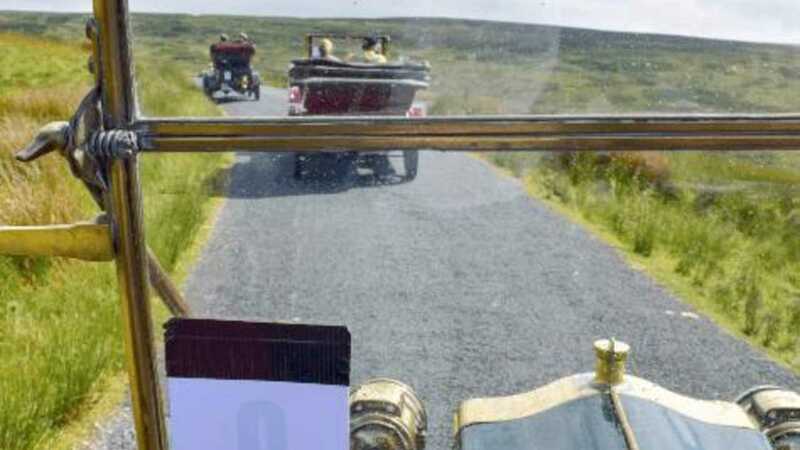 The following morning brought me somewhat more detailed navigational notes, as the second day of the rally was geared towards being a ‘driver’s day’ rather than one which focused on visiting local attractions. 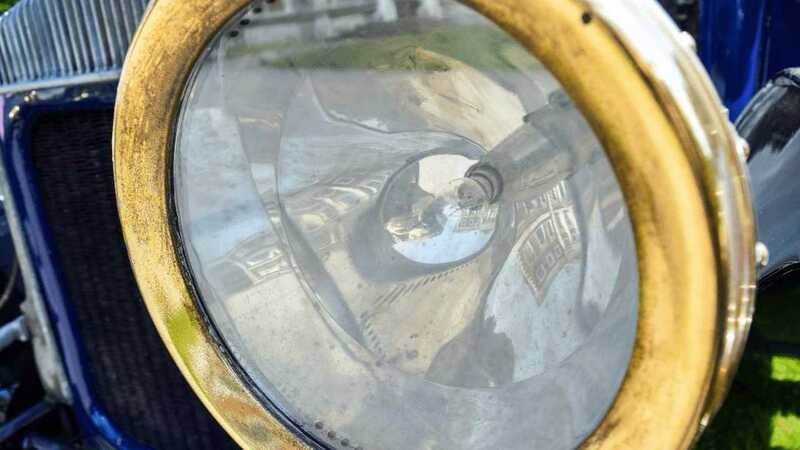 Having acted as a navigator on several previous classic rallies, I was delighted this was the case and settled into giving out instructions and marking off our progress with the elliptical pencil in my hand. From Chipping we skirted along the northern edge of Longridge Fell towards Walker Fold and Chaigley, before crossing the River Hodder and turning up the sharp incline towards Bashall Eaves. The climb continued out of Waddington and up over the fells leading to Newton in Bowland. Steam started to spit from the Maxwell’s radiator cap. Phil muttered something about overfilling the radiator as we passed a few other participants dotted along the roadside, their old engines clearly feeling the strain. We’d already been warned by the organisers that a few challenging hills had been incorporated into the day. 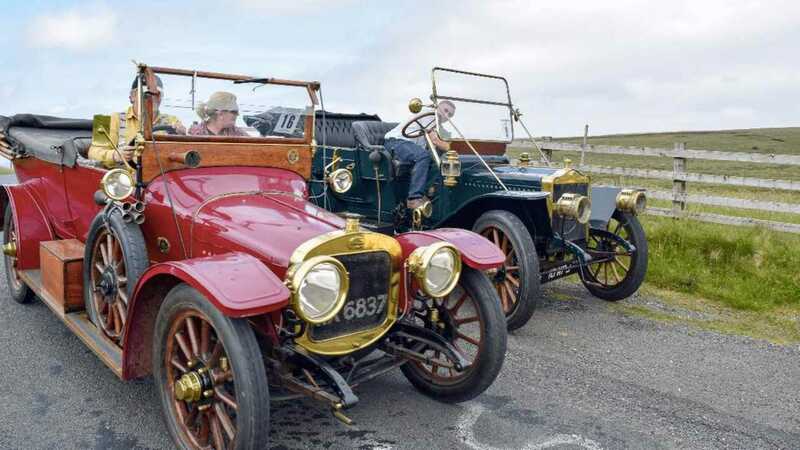 After stopping for a quick photo on a brae above Waddington Fell, where a jolly couple in a 1912 Wolseley waved enthusiastically as they drove by, we got underway again. The Maxwell regained its composure as the flow of hot pink spray that had been hitting the windscreen on the incline slowed. We next drove through Slaidburn. This seemed to a particularly favourable spot for Phil, as he pointed out how the village seemed ‘untouched by time’. As I looked round at the rustic buildings and dry stone walls, I was inclined to agree. It seemed exactly the kind of village one would find set with a kindly snow scene on a traditional Christmas card. 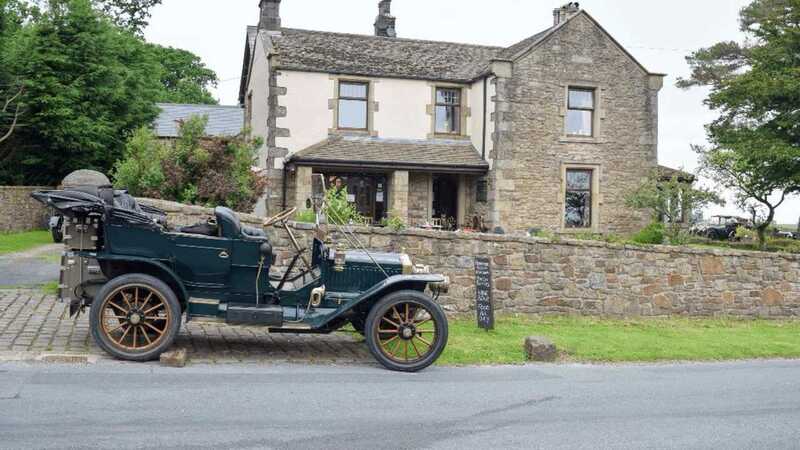 We followed the road for a further nine miles in the direction of Settle, where we stopped for tea and scones at the Old Vicarage Tearooms at Tosside. Panoramic views of Lancashire were had as the Maxwell continued down towards Eldroth and Clapham. Following on for Lancaster we proceeded through Melling and into Low Bentham, where there was a lunch stop at the Punch Bowl Hotel. There was little parking left by the time Phil’s 1910 motor arrived, so the Maxwell gained pride of place right outside the pub’s doorway. From here we crossed the stunning Lythe Fell, through Dunsop Bridge and past the Inn at Whitewell, which proudly belongs to the Duchy of Lancaster, before another return at Gibbon Bridge. The final day of the North West rally began for us with a forecast for showers, so we put up the Maxwell’s roof. We initially headed for Hurst Green, where we saw Oliver Cromwell’s bridge over the River Hodder, before passing through Ribchester by the River Ribble. From there we continued through Mellor and up the steep Goosefoot Lane at Salmesbury Bottoms. Our target that morning was Bolton, and en route we saw Hoghton Towers in their commanding position up on the hill. The Maxwell then turned south towards Horwich, and finally came to the site of what used to be the Musgrave Spinning Company in Bolton. This now houses the Bolton Steam Museum, which opened in 1983 as tribute to Lancashire’s once-proud status as one of the world’s most productive spinning centres. The district boasted over 216 cotton mills, but most were closed by the 1960s. 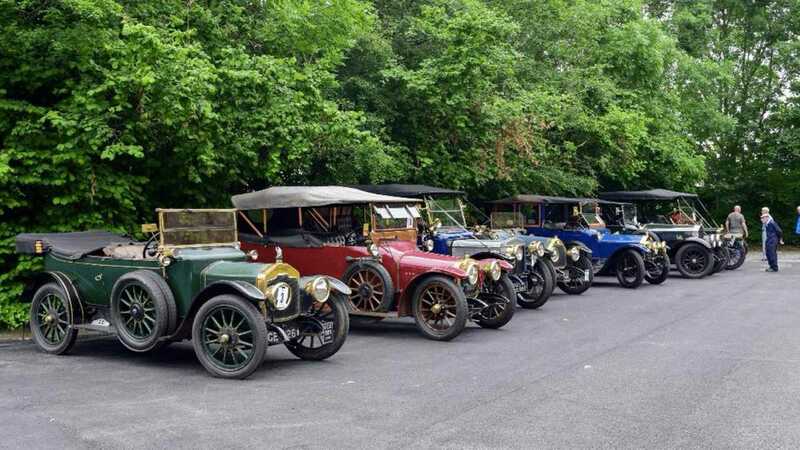 The VCC members temporarily stepped out from their motorcars to take in some of the working industrial engines from years gone by. I joined in, and even found a Haynes manual for my rather more modern Rover 115 on one of the museum’s second-hand bookstalls. Afterwards, the rally curved back round to Horwich for its lunch stop at the Blundell Arms, a historic courthouse dating from 1741. From there, the veteran motorcars followed the A673 to Tockholes, where at St Stephen’s Church lies Jon Osbaldeston. He invented the weft-fork, a simple but important device that could halt a power loom whenever the weft snapped. This consequently saved cotton mill owners a lot of money, but the invention was so easily copied that poor Jon never received any money for his idea. His contribution is, however, at least recognised within his small leafy village. From here we ventured onwards to Mellor and returned to Ribchester again, where we followed Stoneygate Lane that, after a sharp turn to the right, became Forty Acre Lane. A sign here recommended staying in low gear, for it’s a 20 percent descent for three-quarters of a mile. Phil suddenly seemed to be concentrating and working even harder than usual behind the wheel. A stunning view of gold and brown moorland stretched off either side of us. It was a magnificent sight, but I didn’t get to enjoy it for long. As we passed Woodstraw Farm, there was a warm smell in the car. It was pleasant at first, but it got stronger as we made our way down the hill. ‘Ok, I need to put the brakes on …’ said Phil, his voice quite suddenly stern. ‘I need to put them on, but I can’t bring the car to a complete stop using the handbrake. 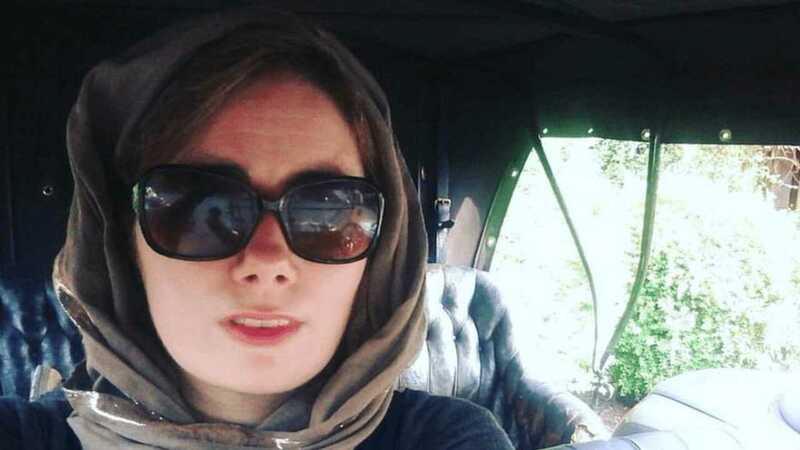 The brakes are so hot now that if I pull the handbrake on, they might set themselves on fire.’ I felt this was not good news on a 20 percent drop, especially when a considerable proportion of the road was still ahead. ‘I will slow down as much as I can, but I need you to jump out and grab something to hold the Maxwell with as soon as you’re out of the car,’ continued Phil. He sounded tense. Perhaps I shouldn’t have been surprised, for I’ve encountered many strange scenarios in my time as a motoring enthusiast. I’ve found myself pushing a 1990s Fiat Cinquecento along the motorway hard shoulder in order to bump-start the engine. I’ve had a bonnet depart on me at 55mph while in a 1950s Standard 8. Then there was the time I had to jump out of the way when a rally car that had come down a very steep incline drove directly towards Kenmore Loch in Scotland with red-hot brakes. I’ve also dodged high-speed pebbles as they’ve flown up from the rear tyres on rally cars on the McRae stages – and not always successfully. ‘Ok, I’m going to slow the car down. That house over there – grab a couple of the boulders from the entrance at the gate and bring them back to the Maxwell as quick as you can,’ said Phil as the car slowed. ‘Absolutely as quick as you can. AS QUICK AS YOU CAN!’ he shouted after me as I jumped out and ran across the road in front of another veteran car, whose driver looked very confused. I grabbed the first large rock I could from the driveway. I felt awful, as I was effectively wrecking someone’s carefully constructed rockery, but Phil was adamant this was the only course of action available. I hastily brought a rock back and thrust it in front of one of the back wheels. ‘QUICK! QUICK!’ urged Phil as he kept the car in position. The smell was getting stronger. As I ran to grab another rock, the wooden blocks on the handbrake were starting to smoulder from contact with the incredibly hot brake shoes. I got the second rock into position, and once Phil was sure the Maxwell wasn’t going to slip, he jumped out, too. ‘Get the water canister out of the back – quick, QUICK!’ he shouted as he grappled coats and other items off the back seats, frantically looking for the canister. 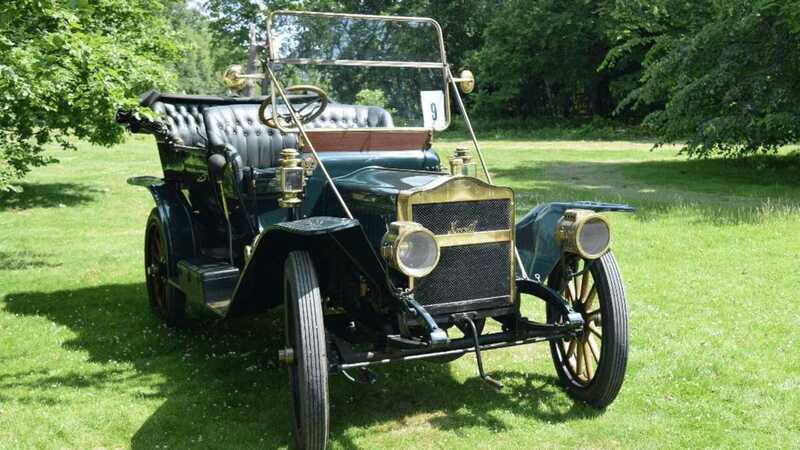 As soon as it was found, he threw water onto the brakes behind the rear wooden wheels. His actions were concentrated and urgent and, unlike me, when the water was thrown on he didn’t relax. Several veteran motorcars passed, with onlookers trying to see what was going on. We were now the ones on the roadside – and so close to the finish, too. Phil said we’d have to keep going down the hill, but it would likely bring further trouble. He said the brakes would be nowhere near cool enough for doing this. We were also almost out of water. Phil climbed back in, and on instruction I moved the rocks before very quickly jumping aboard the troubled Maxwell. As we got moving again, Phil said he couldn’t afford to brake any more than necessary once the descent had flattened out. He was hopeful for a dearth of traffic, and I was told we’d need water again as soon as we were back at the hotel, for there would again be a risk of fire. Unlike the other VCC participants around us, we were not smiling and relaxed as we entered the hotel’s courtyard. Phil brought the Maxwell to a stop as I hopped out and ran straight by the hotel’s reception into the nearest bathroom to find water. With the shallow sinks I could only get half a canister, which disappeared on the first throw at one of the Maxwell’s wheels. However, thankfully a man from the hotel had realised what was going on and had fetched a hosepipe to help cool the Maxwell’s brakes. It was a dramatic end to our otherwise very pleasant three-day adventure.